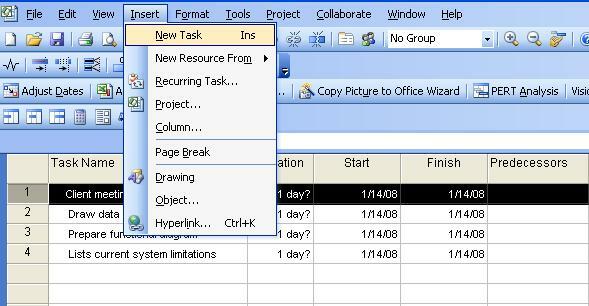 Tasks: You can create a task by typing a name in the �Task Name� field in one of the rows of the task sheet portion of the Gantt chart. After completing the cell entry, project fills in default duration of 1 day for the new task, and defaults start and finish dates for the task. Then your cursor stays at new row for you to enter the next task. Please set the required duration for task. Generally MS Project will calculate the schedule dates based on duration, resource units and task dependencies. Tasks in project plan need to be organized into group of activities that represents major phases of a project. This is equivalent of the Work Breakdown Structure (WBS). The major phase is a summary task and you do not have ability to modify the details of summary task. Summary task start date is the earliest start date of any of its subtasks, and finish date is the latest finish date of any of its subtasks.